The current edition of The Enfield Independent carries an article reminding residents how to report fly-tipping and other forms of rubbish dumping on our streets. Reports should be logged on the Enfield web-site. The Santander Bank next to the market square is to move slightly further down Church Street to make way for a Metro Bank. 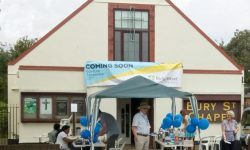 Meanwhile, the Cooperative Bank in London Road is to close in May. We’ve just posted the October Safer Neighbourhoods newsletter for BHP Ward from the Met Police. The results are in from Enfield in Bloom for Bury Lodge Park; Gold for the park and Silver for the Walled Garden. The Friends of Bury Lodge Park are especially pleased with silver as the plants are in their infancy and not yet fully established. Well done to all involved! 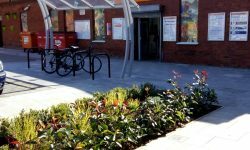 The works, begun in March, were finished today when LBE staff planted-up the two “rain gardens” outside Sainsbury’s and the shop on the corner of First Avenue.